Please note: The Seismic Analysis Code software is available to IRIS Members and Affiliates. As of October 2006, IRIS may also distribute the SAC software to collaborators such as the U.S. Geological Survey, Air Force Technical Applications Center, members of the International Federation of Digital Seismograph Networks and other non-U.S. seismological institutes who are involved in relevant research projects with IRIS. However, IRIS may not distribute the SAC software to any country on the embargoed list of the U.S. Department of Commerce. Due to these export restrictions, SAC software requests must be reviewed by IRIS staff. This process may take several days, and you may be contacted for details or clarification of the information you provide. If you have questions about the status of a request contact webmaster@iris.washington.edu. 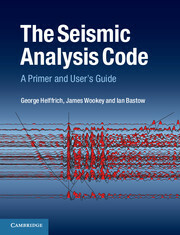 The Seismic Analysis Code: A Primer and User’s Guide by George Helffrich, James Wookey and Ian Bastow has just been published by Cambridge University Press. Because of the nature of the SAC license, IRIS cannot distribute a binary distribution for Cygwin. For a more detailed explanation, see http://cygwin.com/licensing.html. IRIS used to provide a separate source distribution for Cygwin, but recent releases (starting with v1.7) can build on Cygwin with the same source distribution as the other platforms. Cygwin users should request the source distribution and consult the file sac-101.6/Readme.buildsac for Cygwin-related build instructions. Software License Read the SAC Software End User License Agreement, then check the "I agree" box before submitting your request. SAC 2000 SOFTWARE END-USER LICENSE IMPORTANT -- READ THESE TERMS AND CONDITIONS CAREFULLY BEFORE PROCEEDING. BY CHECKING "I AGREE" AND CLICKING "SUBMIT", YOU ACKNOWLEDGE THAT YOU ARE DULY AUTHORIZED TO ENTER INTO THIS LICENSE AGREEMENT ON BEHALF OF THE ORGANIZATION IDENTIFIED IN THE USER LICENSE APPLICATION SUBMITTED TO INCORPORATED RESEARCH INSTITUTIONS FOR SEISMOLOGY. YOU FURTHER ACKNOWLEDGE THAT YOU HAVE READ THIS LICENSE AGREEMENT, YOU UNDERSTAND IT, AND THE ORGANIZATION WILL BE BOUND BY ITS TERMS. IF AFTER READING THE TERMS AND CONDITIONS OF THIS LICENSE AGREEMENT YOU DO NOT CONSENT, YOU SHOULD EXIT THIS PAGE WITHOUT CHECKING "I AGREE" OR CLICKING "SUBMIT", IN WHICH CASE YOU WILL NOT BE PROVIDED ACCESS TO THE SEISMIC ANALYSIS CODE SOFTWARE, SAC 2000 VERSION 100 AND ALL SUBSEQUENT VERSIONS RELEASED THROUGH IRIS. 1. IRIS. (a) Incorporated Research Institutions for Seismology ("IRIS") agrees to provide the organization or other applicant identified in the User License Application ("you") with access to the Seismic Analysis Code Software, SAC 2000 Version 100 and all subsequent versions released through IRIS (the "Software"), and in consideration thereof, you agree to all of the terms and conditions set forth in this License Agreement (this "License Agreement"). (b) IRIS shall provide you with such user IDs and passwords as may be necessary for you to access the Software. During the term of this License Agreement, IRIS may provide your employees and/or agents with user IDs and passwords. You agree that all such user IDs and passwords are the confidential information of IRIS and shall be maintained in strict confidence, and not disclosed to third parties without IRIS' prior written authorization. IRIS may grant your employees or agents passwords on condition that they execute an on-line password use agreement. You agree that any such on-line password use agreement will be a valid and binding agreement when executed by such employees or agents, and you agree to make best efforts to ensure that such employees and agents comply with the terms of such password use agreements and to notify IRIS promptly if such an employee or agent terminates his or her employment or engagement with you. Your employees and/or agents are authorized to use the user IDs and passwords only for accessing the Software for the Licensed Use (as defined herein) and for no other purpose. You, at your own expense, shall obtain, maintain and operate suitable and fully compatible computer equipment, communication devices, printers and related equipment, consumable items and software, including Internet connections, required to access and use the Software. You shall assume full responsibility including expenses for remote connectivity necessary for the transmission of data and to access and use the Software. 2. GRANT OF LICENSE: IRIS grants to you a non-exclusive, non-transferable license to the access and utilize the Software, subject to all of the terms and conditions set forth in this License Agreement, including, without limitation, the following: (a) You may access and use the Software solely in the regular course of your teaching and/or research solely for the purposes of supporting scientific research activities (the "Licensed Use"). This License Agreement does not convey to you any interest in or right to use the Software, except the limited right of access and use licensed hereunder, revocable at any time by IRIS in accordance with the terms of this License Agreement. No form of remote access to IRIS' computer system is permitted, other than as specified herein, and as authorized by IRIS from time to time in connection with the Licensed Use. (b) You agree not to cause or permit any person, including but not limited to your employees to: (i) access, copy, modify, rent, lease, sub-license, distribute, disclose, or use the Software, or any portion thereof, except as expressly provided in this License Agreement; (ii) permit any third party to access or use the Software, unless IRIS provides its prior written consent to such third party access or use. (c) You acknowledge and agree that the Software is proprietary to IRIS or its licensors; that IRIS or its licensors retains all right, title and interest in and to the Software and all copies, improvements, enhancements, modifications and derivative works of or based on the Software (including, without limitation, any customization of the Software or other software developed by IRIS for the Licensed Use); that you shall not tamper with, bypass, or alter any security feature of the Software or of IRIS's computer system, or attempt to do so; that you shall take all reasonable steps to ensure that the provisions of this License Agreement are not violated by any person under your control or in your service; that title to and ownership of any and all proprietary rights including, without limitation, all patents, copyrights, trademarks and trade secrets embodied in the Software and in any complementary computer programs resident on IRIS's computer system shall remain with IRIS (or other proprietary rights owner, if licensed to IRIS by a third party licensor). You shall not delete or alter any proprietary rights notices contained in the Software. (d) Notwithstanding the foregoing, you may prepare derivative works based on the Software, and IRIS shall provide the source code to the Software to you, to enable you to prepare derivative works based on the Software; provided, that all derivative works incorporating the Software shall be owned by IRIS, and your use thereof shall be solely pursuant to the license granted herein. You acknowledge and agree that IRIS, may, in its discretion, distribute all such derivative works of the Software to its other licensees, and that IRIS's intention in this regard is to promote scientific research. You agree to keep IRIS currently apprised of any derivative works you create based on the Software, and you shall provide copies of the source code for all such derivative works to IRIS promptly. 3. TERMS AND CONDITIONS. IRIS may publish SAC 2000 Terms and Conditions ("Terms and Conditions") from time to time and will provide the same to you by means of written notice, publication on-line in connection with the Software and/or such other reasonable means that IRIS shall determine. Notwithstanding any other provisions of this License Agreement, your continued access of the Software after written notice, publication on-line in connection with the Software and/or such other reasonable means that IRIS shall determine, shall serve as your agreement to abide by the Terms and Conditions, as revised from time to time, as if they were fully set forth herein. The Terms and Conditions, including revisions thereto, shall be deemed to be incorporated into this License Agreement by this reference and you expressly agree and warrant that access to and all usage of the Software shall be in compliance with all of the Terms and Conditions herein. 4. ENHANCEMENTS. From time to time, IRIS may, in its sole discretion, modify, enhance or otherwise revise the functional features of the Software and make such changes available to you at no additional charge, in lieu of the functional features previously provided. 5. LIMITED WARRANTY: THE SOFTWARE IS SUPPLIED "AS IS" WITHOUT WARRANTY OF ANY KIND. THIS LICENSE AND THE ASSOCIATED SOFTWARE ARE PROVIDED WITHOUT WARRANTY OF MERCHANTABILITY OR FITNESS FOR A PARTICULAR PURPOSE OR ANY OTHER WARRANTY, EXPRESS OR IMPLIED. IRIS MAKES NO REPRESENTATION OR WARRANTY THAT USE OF THE SOFTWARE WILL NOT INFRINGE ANY COPYRIGHT OR OTHER PROPRIETARY RIGHT. IRIS (1) DOES NOT ASSUME ANY LEGAL LIABILITY OR RESPONSIBILITY FOR THE ACCURACY, COMPLETENESS, OR USEFULNESS OF THE SOFTWARE; AND (2) DOES NOT WARRANT THAT THE SOFTWARE WILL FUNCTION UNINTERRUPTED, THAT IT IS ERROR-FREE OR THAT ANY ERRORS WILL BE CORRECTED. 6. LIMITATION OF LIABILITY: (a) You acknowledge that IRIS' obligations and liabilities with respect to the Software are solely as provided in this License Agreement, and that your use of the Software is at your own risk and you are responsible for the consequences of any use of the Software, whether or not such use was consistent with the license granted hereunder. IN NO EVENT WILL THE IRIS OR ITS LICENSORS BE LIABLE FOR ANY INDIRECT, INCIDENTAL, CONSEQUENTIAL, SPECIAL OR PUNITIVE DAMAGES OF ANY KIND OR NATURE, INCLUDING BUT NOT LIMITED TO LOSS OF PROFITS OR LOSS OF DATA, FOR ANY REASON WHATSOEVER, WHETHER SUCH LIABILITY IS ASSERTED ON THE BASIS OF CONTRACT, TORT (INCLUDING NEGLIGENCE OR STRICT LIABILITY), OR OTHERWISE, EVEN IF IRIS HAS BEEN WARNED OF THE POSSIBILITY OF SUCH LOSS OR DAMAGES. (b) If at any time an allegation of infringement of any rights of any third party is made, or in IRIS or IRIS's opinion is likely to be made, with respect to the Software, IRIS may, at its option and at its own expense either (i) obtain for you the right to continue using the Software, (ii) modify or replace the Software or any portion thereof so as to avoid any such claim of infringement, or (iii) terminate this License Agreement and refund to you the development fee paid by you for customization of the Software for your use (if any). IRIS's sole liability to you for damages pursuant to this Section 6(b), if any, shall not exceed the amount of the license fee paid by you for the Software subject to any such claim. (c) IRIS SHALL NOT BE LIABLE OR RESPONSIBLE FOR ANY LOSS, INJURY, CLAIM, LIABILITY, DAMAGE OR EXPENSE OF ANY KIND OR NATURE, INCLUDING ATTORNEYS' FEES, FOR ANY INTERRUPTION OF SERVICE OR LOSS OF USE OF THE SOFTWARE, FOR ANY LOSS OF BUSINESS BY YOU, OR FOR ANY OTHER LOSS FROM A CAUSE OR CAUSES WITHIN OR BEYOND THE CONTROL OF IRIS IN CONNECTION WITH THE SOFTWARE CAUSED BY, RESULTING FROM OR IN ANY WAY RELATED DIRECTLY OR INDIRECTLY, TO THE SOFTWARE LICENSED HEREUNDER, INCLUDING, BUT NOT LIMITED TO, ERRORS, OMISSIONS OR INACCURACIES IN THE DATA GENERATED BY THE SOFTWARE. IF, FOR ANY REASON, BY OPERATION OF LAW OR OTHERWISE, ANY PORTION OF THE FOREGOING LIMITATION OF LIABILITY SHALL BE VOID, THEN, IN SUCH EVENT, THE MAXIMUM LIABILITY OF IRIS, IF ANY, SHALL BE LIMITED TO GENERAL MONEY DAMAGES IN AN AMOUNT NOT TO EXCEED THE TOTAL AMOUNT YOU ACTUALLY PAID TO IRIS BY LICENSEE (IF ANY) FOR LICENSING THE SOFTWARE DURING AND FOR A PERIOD OF TIME COMMENCING UPON THE OCCURRENCE OF SUCH ERROR, DEFECT OR FAILURE AND CEASING UPON THE DISCOVERY OF SUCH, IN WHOLE OR IN PART, PROVIDED, HOWEVER, THAT IN NO EVENT SHALL SUCH PERIOD OF TIME EXCEED THE SIX (6) MONTH PERIOD IMMEDIATELY PRECEDING THE DATE ON WHICH SUCH ERROR, DEFECT OR FAILURE IS FIRST DISCOVERED. 7. INDEMNIFICATION: Neither IRIS or any of its directors, officers, employees, agents, or representatives nor any of its licensors (including, without limitation, the Regents of the University of California, and its officers, employees, agents, the Department of Energy, and its employees and agents, the Software Developers, the Software sponsors, nor any of their agents, officers and employees (the "IRIS Indemnified Parties") shall have any liability for, and you shall defend, indemnify and hold each of the IRIS Indemnified Parties harmless from and against, any claim, loss, demand, liability, obligation and expenses (including reasonable attorneys' fees) based upon or arising out of any loss, injury or damage, including but not limited to, any personal injury or property damage, arising out of, pertaining to, or resulting in any way from, the use or of the Software by you and/or any of your directors, officers, employees, representatives, agents or contractors. Licensee will pay any and all costs, including reasonable attorney's fees, incurred by IRIS or any of the IRIS Indemnified Parties enforcing this indemnification. 8. EXPORT CONTROL LAWS LICENSEE will comply with all applicable United States and foreign laws and regulations concerning the transfer of Licensed Products and related technical data, including but not limited to International Traffic in Arms Regulations (ITAR) and Export Administration Regulations. The Software is currently under a Department of Commerce EAR99 level of export control and thus is not allowed to be distributed to embargoed countries. 9. COPYRIGHT MARKING You will affix to all copies of Software and their containers that are made, used, or sold or otherwise distributed under this Agreement: a) the proper copyright notice in accordance with applicable copyright marking laws; and b) the following notice: "This work is based on a pre-existing work created at the University of California, Lawrence Livermore National Laboratory (UC LLNL) under contract No. W-7405-ENG-48 between the U.S. Department of Energy and The Regents of the University of California for the operation of UC LLNL. That pre-existing work was sponsored by an agency of the United States Government. NEITHER THE UNITED STATES GOVERNMENT NOR THE UNIVERSITY OF CALIFORNIA NOR ANY OF THEIR EMPLOYEES, MAKES ANY WARRANTY EXPRESS OR IMPLIED, OR ASSUMES ANY LEGAL LIABILITY OR RESPONSIBILITY FOR THE ACCURACY, COMPLETENESS, OR USEFULNESS OF ANY INFORMATION, APPARATUS, PRODUCT, OR PROCESS DISCLOSED IN THE PRE-EXISTING WORK, OR REPRESENTS THAT ITS USE WOULD NOT INFRINGE PRIVATELY OWNED RIGHTS." 10. TERMINATION: This License Agreement may be terminated immediately by IRIS upon breach of any provision of this License Agreement by you. Upon any termination of this License Agreement, you shall immediately discontinue use of the Software, and IRIS may disable any and all user IDs and passwords provided to you or to others on your behalf. Either party may terminate this License Agreement for convenience on thirty (30) days prior written notice. 11. GOVERNING LAW; ATTORNEY'S FEES: This License Agreement shall be governed by and interpreted in accordance with the laws of the District of Columbia, applicable to contracts entered into and to be wholly performed therein, without given effect to conflict of laws principles thereunder. You agree that any legal or equitable action of whatever nature by or against IRIS arising out of or related in any respect to this License Agreement shall be brought solely in the courts located in the District of Columbia, except that in the event IRIS is sued or joined by a third party in any other court or in any other forum in respect of any manner which may give rise to a claim by IRIS hereunder, you consent to the jurisdiction of such court or forum over any claim which may be asserted by IRIS therein. You or IRIS may enforce any judgment rendered by any of the aforementioned courts, in any court of competent jurisdiction. The parties hereby consent to and waive any challenge or objection to personal jurisdiction and venue of the above-mentioned courts, including any claim that such action, suit or proceeding has been brought in an inconvenient forum, and consent to service of legal process by any means consistent with applicable law. 1. MISCELLANEOUS: This License Agreement constitutes the entire agreement between IRIS and you with respect to the subject matter hereof, and supersedes all prior oral or written understandings, communications or agreements not specifically incorporated herein. This License Agreement may not be modified except in writing duly signed by an authorized representative of IRIS and you. If any provision of this License Agreement is held to be unenforceable for any reason, such provision shall be reformed only to the extent necessary to make it enforceable, and such decision shall not affect the enforceability (i) of such provision under other circumstances, or (ii) of the remaining provisions hereof under all circumstances. Headings shall not be considered in interpreting the License Agreement. BY ACCESSING THE SOFTWARE, YOU ACKNOWLEDGE THAT YOU HAVE READ THE TERMS OF THIS LICENSE AGREEMENT AND AGREE TO BE BOUND BY ITS TERMS. YOU ACKNOWLEDGE YOU HAVE READ THIS AGREEMENT, UNDERSTAND IT, AND AGREE TO BE BOUND BY ITS TERMS AND CONDITIONS. FURTHERMORE, YOU AGREE NOT TO DISTRIBUTE COPIES OF THE SEISMIC ANALYSIS CODE SOFTWARE.